For Public Hospital District No. 304 commissioners, Christmas came in November. At their Nov. 15 meeting, the commissioners voted unanimously to form an alliance with PeaceHealth St. Joseph Medical Center. The proposed alliance had been approved earlier in November by PeaceHealth’s community board, the PeaceHealth Northwest Network Board, and the PeaceHealthSystem Governing Board. Two years in the making, the decision brought applause from the commissioners and the small audience attending the meeting. Under the alliance, PeaceHealth will enter into a long-term agreement with the hospital district to lease and operate what will become PeaceHealth United General Medical Center effective July 1, 2013. United General would remain a critical access hospital and the hospital district would retain ownership of its facilities. “This is a lease agreement in a very broad sense, since United General retains its assets and properties, and PeaceHealth assumes the operation of those assets,” said United General CEO Greg Reed after the decision. Reed said the board of commissioners would remain in place, as would the hospital district itself. He added that tax funds would be used to help defray necessary startup investment costs and improve the operation for the first three to four years. United General first approached Peace-Health more than two years ago to explore a closer relationship. In May 2010, PeaceHealth Medical Group established a clinic on the United General campus, staffed by physicians specializing in pulmonology, gastroenterology, and sleep medicine. “Our community responded very positively to those new services,” said United General Communications Director Valerie Stafford. Since then, other Bellingham physicians have moved to United General, including cardiologists and surgeons. “This alliance builds strength for United’s future. A close relationship with PeaceHealth would better position United to grow and would allow us to leverage our collective expertise and experience,” said Reed. According to Reed, because of the overlapping service areas and specialty and referral services already provided in the hospital district, many residents already are familiar with the care they receive from PeaceHealth. PeaceHealth St. Joseph Medical Center is part of the PeaceHealth system, with medical centers in Alaska, Washington, and Oregon. In addition to the hospital and PeaceHealth Medical Group, PeaceHealth’s local services include several Centers of Excellence and the specialty clinic in Sedro-Woolley. Hard on the heels of the United General/PeaceHealth alliance comes a decision from the Board of Commissioners of Public Hospital District No. 304 to acquire East Valley Medical & Diagnostic Center and East Valley Pharmacy. The clinic, located at 7438 South D Ave. in Concrete, will become one of three family practices to be operated by United General. The other two are in Sedro-Woolley. United General will begin leasing the clinic and pharmacy facilities effective Jan. 1. Dr. Dan Garcia and his wife, Emily, who have owned and operated the clinic for 30 years, will become United General Hospital employees. Ruhl cited health care reform, a dramatic increase in charity care, and higher volumes of Medicare/Medicaid patients as factors that make it difficult for independent clinics to survive on their own. “We realize that transportation and unemployment are serious issues for people in this part of Skagit County, and we are committed to preserving the medical services they rely on,” said Ruhl. Public Hospital District No. 304 Board President Chuck Ruhl signs a lease agreement authorizing PeaceHealth St. Joseph Medical Center to lease and operate what will become PeaceHealth United General Medical Center effective July 1, 2013. Looking on are Public Hospital District No. 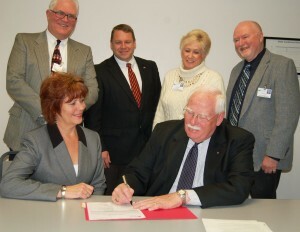 304 Commissioners (standing, left to right) Bob Stanley, David Walker, Jeri Kaufman, and Gary Kent. Seated with Ruhl is Nancy Tieman, Vice President of Strategy, Innovation and Development at PeaceHealth St. Joseph Medical Center.